We’ve gotten a ton of great feedback from our students after making the switch from G+ to Slack for our student community. This week, Gabriel Oladipo, a Frontend alum and active member of the community, took some time to describe his own experience. What is Slack? 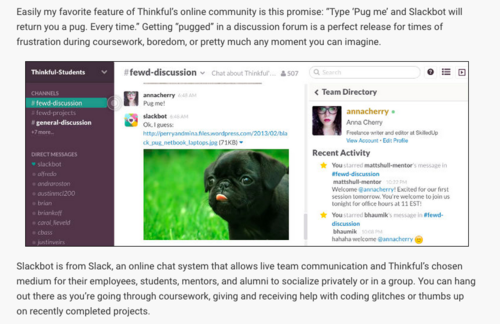 Put simply, Slack is a communication platform Thinkful students can use to chat with each other in real time. As someone who used Slack extensively during my own time with the program, I wanted to share some of its benefits with you. One obvious benefit is that you’ll get quick access to someone who can help. While mentors are excellent and have no problem answering questions, you only meet with them once a week (unless you attend Office Hours). One thing about learning to code is that problems usually don’t wait until it’s convenient for you. Normally, if you ran into a problem that you couldn’t solve yourself, you might either wait for your next mentor session or shoot them an email, both of which can cost you valuable time. However with Slack, you can ask for help with an issue in real-time and have someone to respond quickly, saving your mentor meetings for major problems and allowing you to push through the minor issues that often hold people up. Another benefit to Slack is that you get access to all the outside resources your fellow students are taking advantage of. There’s so much great content out on the web now, and not all of it can be covered within the curriculum. 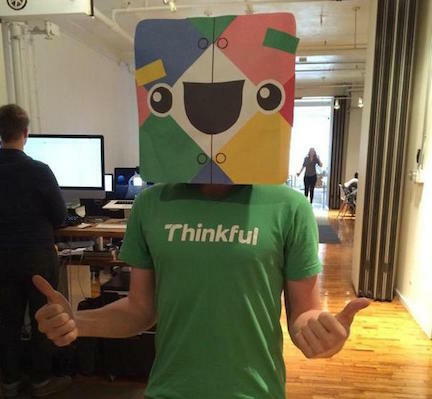 However, many students and mentors read additional information during their time with Thinkful, so you’ll be tuned into great content that your peers are reading regularly As I was going through the Frontend Web Development curriculum, I focused on the material, but I also had an interest in UX design, which wasn’t covered as heavily. As such, I found the UX articles that other students shared to be a very welcome addition to my learning. As a Thinkful student, you have access to every channel in Slack so you can check out what other students (Python, Ruby, Swift, etc) are learning. The third benefit is the least tangible, but has the most impact of all of these. The best thing about taking advantage of Slack is that you become a part of a community. That means getting all of the traditional benefits of a community: a place to act as a support system for when you have problems and need to push past them, get advice from those further ahead in their learning, form friendships with others who now share a common experience, unwind and have fun after plugging away at the curriculum all day, share your triumphs with others, and much more, all at your own schedule. Services such as the curriculum and mentor support are excellent, but its things like Slack that take Thinkful from being just a learning platform to being a community, so be sure to take full advantage of it.